One of my favorite summer breakfasts (or snacks) combines two of my favorite seasonal flavors: Strawberries and fresh basil. Add in some good balsamic vinegar and you have delicious Strawberry Basil Relish. 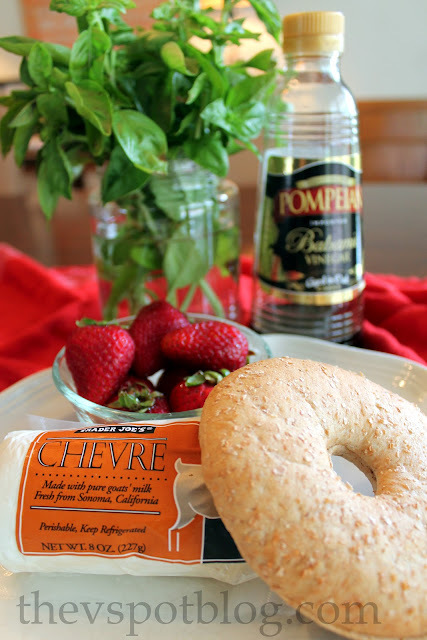 This yummy strawberry, goat cheese and basil combination has just a touch of balsamic vinegar, and when it’s served on top of a warm, toasty bagel I think it’s a little bite of heaven. It’s super easy to put together too. 1. Wash, hull and slice/chop strawberries. 2. Wash, dry and stack a few leaves of fresh basil. 3. Roll up basil leaves and snip into little pieces using a knife or kitchen shears. 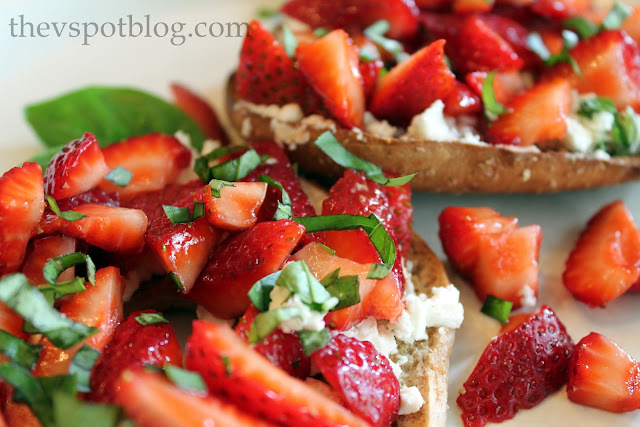 Toss strawberries and basil with a drizzle of balsamic vinegar. 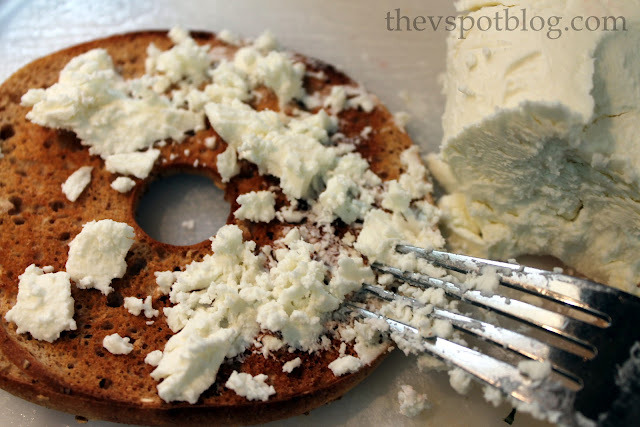 Toast up a bagel (I like whole wheat) and crumble the goat cheese onto the warm bagel. Spoon your delicious Strawberry-Basil Relish over the top of the top of everything and enjoy! Tip: It tastes even better if your kids are in another room when you eat it. Fresh strawberries…. fresh basil…. goat cheese… peace and quiet…. with a little drizzle of balsamic. What’s your favorite summer breakfast? Why do the taste buds shut down when Legos are flying through the air? Great pics Viv! I am not a fan of goat cheese…but I would try this with a schmear of cream cheese instead…Yum! Me thinks my girls would love this! I love combining strawberries and basil together! This relish looks to die for! This looks amazing! I love goat cheese but haven’t had it in forever. Can’t wait to try this! Oh my heck I totally pinned. I want to try this!